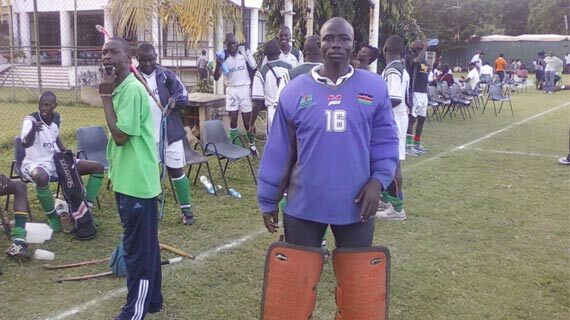 For hockey lovers, he has been a darling and a hard nut to crack to opposing teams; He is James Kayeko, the Kenya hockey national team first choice keeper and the 2011 Kenya hockey premier league champions’ Kenya police number one stopper. His humble beginning and perhaps how he joined hockey is something of interest. “I come from an extremely humble family my parents struggled to pay for my school fees back then when I was in Kisumu day and hockey was not really my game. I was a very good goal keeper for the school football team, and by far football was my game, I was called as a stand in keeper and that was the disguised beginning of my hockey carrier,” Kayeko begins her narration. “Eventually I started playing hockey and with time, I joined Kisumu Simba while still a student. Instead of the allowances they were giving me I struck a deal with the then chairman that the club would pay my school fees until I completed my secondary school education”, he says. The 25 five year old has had an uprising star as much as hockey is concerned, and attributes the game to what he has achieved in his life. “I have played for premier league side Kisumu Simba and Wazalendo. I was recruited to join police while playing for Wazalendo. Their coach identified me and recommended me for recruitment, and through him, I joined the law enforcers,” he says. Kayeko went on to become a law enforcer courtesy of hockey and has been playing for the 2011 hockey champions Kenya police for the last four seasons. In the national levels he has endeared himself to fans; he joined the under-18 in the year 2004 and the seniors two years later. “I participated in the Olympic qualifiers played here in Nairobi though we did not make it to Beijing it was a memorable experience I appreciated having represented the country. We have been unlucky for so long. However, 2011was the highlight of my career, we won the league which had been elusive for such a long time. It was the greatest feeling,” he adds. The keeper urges hockey lovers in the country not to give up on an Olympics dream. He says that they were close to qualifying in the qualifiers that were held in Zimbabwe but failed by a whisker. At the club level, Kayeko has had an opportunity to represent two clubs at the club championships first Kisumu Simba in 2006 and in 2011, Lusaka Zambia with Kenya police. However, his successful hockey carrier has not been one without challenges. Kayeko explains how injuries have been a shortcoming. “Injuries have been my greatest undoing because they deter progress. They have made me not play crucial matches for instance, I have just recovered from a knee injury but I am now ready to start my training to prepare for the forthcoming league”. “The league will be very competitive, teams will be seeking to dethrone us, but I assure them we will fight with all arsenals to retain the trophy”, he confidently says. His main ambition before he calls it a day in his hockey career is a win at the club world cup. Intellectually he has not been left behind, he has a degree in forensic investigation from Egerton University and he is currently pursuing flight operation at Wilson airport. “I will not be in the game forever, I want to retire and do my business or probably sponsor my own club in hockey, that depends on life goes”, he concludes.